Give now online or text FUMCAUSTIN (all caps) to 73256 to give using text messaging and select the “Easter and Christmas” fund. Each year we remember that Advent is a season of anticipation. We anticipate the coming celebration of Christ’s birth, and we anticipate Christ’s return—the time when God will restore all things through God’s own loving presence. In Christmas, we remember that God chooses to be with us, and that God’s presence truly changes lives. We get to join God in changing lives each year through our Christmas Offering, a gift to which we contribute beyond our regular giving for the year. This year, our offering will go toward two efforts—one local, and the other global. 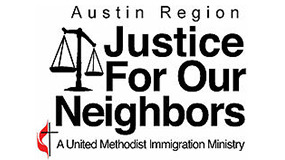 First, we will contribute locally toward the work of Austin Region Justice for Our Neighbors (ARJFON), a hospitality ministry of the United Methodist Church that welcomes immigrants by providing free or low-cost, expert immigration legal services to low-income immigrants, refugees and asylum seekers. We recently learned of ARJFON’s need for additional funds to hire expert witnesses to testify in cases of asylum seekers. These expert witnesses make a tangible difference: last year, every case that included an expert witness ended favorably for the client. In cases without an expert witness, they only won 1 case out of 3. Our help can literally change someone’s life by directly helping their legal case. Second, we will devote a portion of our Christmas offering to support our apportionments, the gift we make to support the wider ministry of the United Methodist Church. We make this gift with the belief that it is more important than ever to support the good that is possible through our worldwide connection. Our apportionments fund ministry for the whole denomination, across the world. For example, the General Board of Church and Society provides a witness as the only non-governmental building on Capitol Hill in Washington, D.C. Through our ministry in that space, staff members organize and advocate for policies that align with the United Methodist Social Principles. They organize and host coalitions that have developed policies such as the Americans with Disabilities Act; they advocate directly with legislators to prevent war and to provide affordable health care for all Americans. Right now, they are educating and advocating on our behalf for holistic immigration reform that addresses the root causes of the immigration crisis. This is only one example of the many ways our apportionments reach around the world to make a difference. Our mission is both global and local; God works through individual churches and entire denominations; God’s love transforms individual lives and complex systems. I pray that you’ll join me in this effort of joining God’s transformation this Christmas. You can make your gift anytime between now and the end of the year by returning the enclosed envelope to the church office, or by simply marking your check “Christmas Offering” and dropping it in the offering plate.